Photo: Iolanda Costa. Luxury Ecuador Tours & Travel. The land price includes escorted transfers, private excursions with a professional guide and chauffeur, entrance fees, selected category of accommodations, gourmet cuisine (see details), all transportation, and travel insurance for guests through the age of 59 years (over that age, there is a supplementary fee). All prices are per person based on two people sharing a guest room. For a detailed description of our services, see Opulent Itineraries. Iglesia de San Vicente Ferrer, Quiroga, Otavalo Valley, Ecuador. Photo: Mylene d'Auriol Stoessel. Luxury Ecuador Tours & Travel. Departing from Quito for the day, view an Incan Sun Temple, visit artisans' pueblos or hike around a crater lake, "barter with the natives" in the mystical Otavalo Valley and have lunch in a Spanish colonial hacienda dating back to 1602. Day 1: Quito (Otavalo Indian Market & Surroundings). Departure north from Quito. 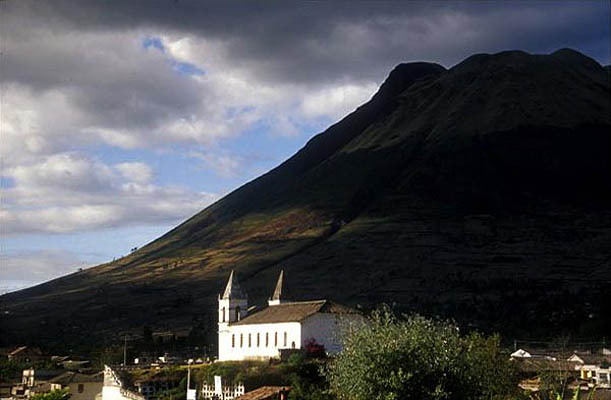 At the foot of the Imbabura Volcano, lies the valley of Otavalo. Visit the ruins of the Incan Sun Temple at Caranqui, then choose between two options. For those more interested in native cultures, visit the village of Peguche, where musical instruments and woolen tapestries are made, the nearby sacred waterfall and other artisans' pueblos. For those more interested in nature, drive up to Cuicocha Lake and hike around this flooded volcanic crater. 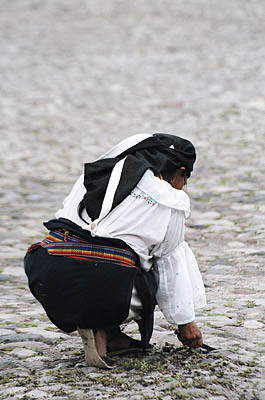 Time to explore the Otavalo Indian market, which dates back to pre-Inca times. Lunch at the Hacienda Cusín. 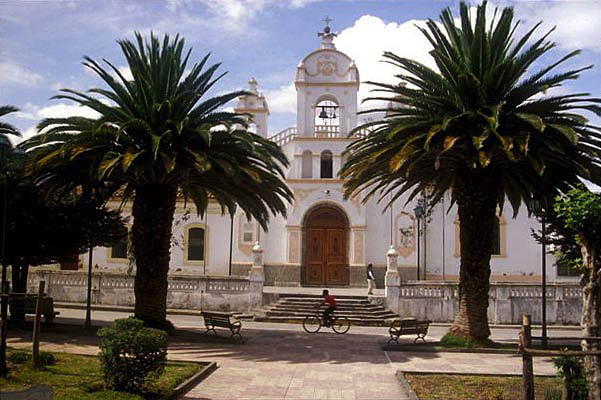 Continue to Cayambe's "Middle of the World" Monument, then see how the pueblo's traditional biscuits and cheese are made. 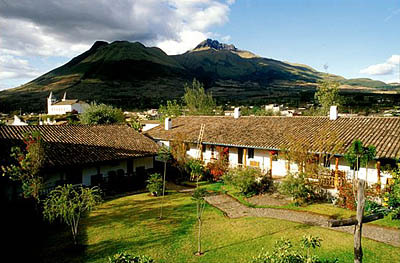 Returning to Quito under the shadow of the Cayambe Volcano, arrive at the Casa Gangotena. Dinner at Alma. Overnight in the Casa Gangotena -- Plaza View Room. Day 2: Quito - Your next destination. Continue on a cruise of the Galapagos Islands or an expedition to Ecuador's Amazon Rainforest. 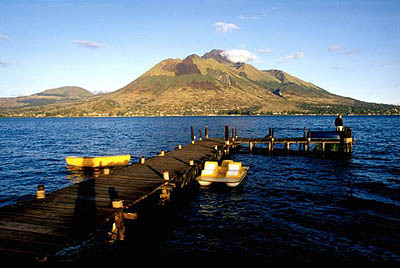 Imbabura Volcano and San Pablo Lake, Otavalo Valley, Ecuador. Departure north from Quito. At the foot of the Imbabura Volcano, surrounded by clear lakes, patchwork-covered hills and plantations of corn, lies the valley of Otavalo, a market town ensconced in its own mystical past and whose people are proud of their cultural heritage and traditions. Visit the ruins of the Incan Sun Temple at Caranqui, then choose between two options. For those more interested in native cultures, visit the village of Peguche, where musical instruments and woolen tapestries are made, the nearby sacred waterfall and other artisans' pueblos. For those more interested in nature, drive up to Cuicocha Lake and hike around this flooded volcanic crater with its twin islets. Here, you will observe a particular species of orchid that grows at this altitude (3,220 meters, or 10,562 feet). Time to explore the Otavalo Indian market, which dates back to pre-Inca times. The market is an experience for all senses: the aromas of traditional fare, soothing Andean panpipes, a kaleidoscope of colors, soft alpaca scarves and customary bargaining. The Otavaleños are owners of a rich inheritance, the customs of their craft; lovers of the rhythm of their music and their dance; and disciples of the legends of their earth mother, Pachamama. Experience an encounter with this proud race of people, whose cultural integrity endures, and discover ancient haciendas, authentic workshops and the incredible landscapes and lagoons of these fertile lands of the Gods. Hacienda Cusín, Otavalo Valley, Ecuador. Lunch at the Hacienda Cusín. Cusín was purchased by the prominent Luna family from King Philip II at an auction in Spain in 1602. The estate comprised the two valleys of Gualavi and La Rinconada, and all the land between the valleys and the lake, approximately 100,000 acres. During the last 400 years, Hacienda Cusín remained, for the most part, in the hands of two different Spanish families and was operated as a farm. After falling into ruins after several decades of neglect, the hacienda was restored in 1990 and opened for international tourism. Returning to Quito under the shadow of the Cayambe Volcano, arrive at the palatial Casa Gangotena. Dinner of creative cuisine by chef Miguel de Arregui at Alma. Overnight in the Casa Gangotena. Iglesia de San Pablo and the Imbabura Volcano, Otavalo Valley, Ecuador. Breakfast. Continue on a cruise of the Galapagos Islands or an expedition to Ecuador's Amazon Rainforest.